Local anaesthetic will be administered as usual. 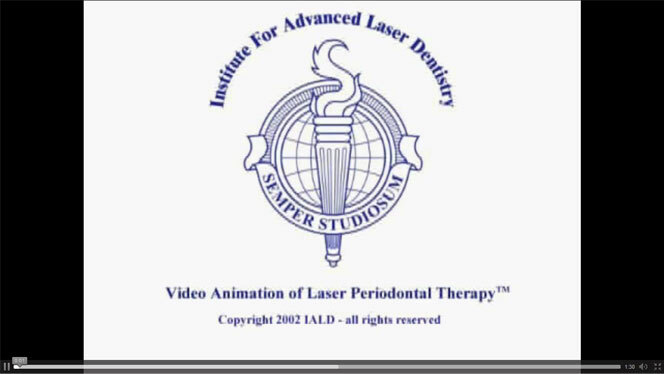 The Laser is then placed between the tooth and gum and in effect the light energy from the laser kills bacteria and allows the soft tissues to re grow, without causing trauma to hard tissues or bone. The removal of the bacteria then allows and encourages the gum to reattach to the tooth. The diode laser selectively removes diseased or infected pocket epithelium from the underlying connective tissue. Since the laser energy is quite selective for diseased tissue, the underlying healthy connective tissue is spared, thereby permitting healing and regeneration rather than formation of a pocket seal by long junctional epithelium. 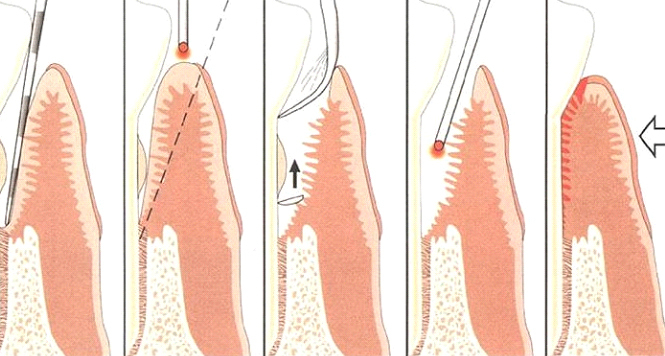 There will be a significant reduction in pain/bleeding/swelling of gums after this procedure, as Laser Assisted Periodontal Treatment spares more healthy tissue than root planning or osseous surgery. Laser treatments are often post operatively painless and bleed less. The usual non-surgical debridement still needs to be carried out (to remove plaque and calculus).